Being a CIT gives you a unique training opportunity that will serve you well should you ever desire to return as a camp counselor, work in daycare or after school programs, or become a coach or mentor for younger kids. 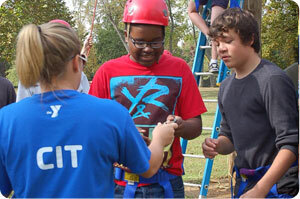 Our CIT program is specifically designed for teens who are interested in working with kids. We teach critical counseling skills, behavior management, and instruction techniques. CIT year is about learning practical skills that you will hone at camp. For example, you will work with our staff as assistant instructors in the various program areas across Tockwogh. You will also be assigned a cabin to help with everything from running activities to working with homesick campers. Camp is after all about learning through positive relationships and our counselors are role models for our CITs as much as they are for campers. With our staff as primary instructors and counselors, you get to practice your newly learned techniques without full responsibility for the cabin or curriculum. These interactions with campers, staff, and peers are at the top of the list of highlights your CIT summer has to offer. More than anything, the CIT program is intended to further your personal growth and to help you become a well-rounded leader. By the end of the month, you will become better at understanding group dynamics, working with children, developing skills in others, and taking initiative. You will also find a confidence in yourself that only comes from having supervised and supported others. It is an amazing feeling. The opportunity you have to make a positive, lasting impact on the new generation of Tockwogh campers is one not to be missed! In addition to all of the on camp time, the CIT’s also go on an overnight camping trip to get away from camp, enjoy each other’s company, reflect and celebrate all that they have learned throughout the month. CIT applications are accepted throughout the year, though it is highly recommended that they are sent in early. The application process consists of a written application, 2 written references, and an interview. Being a LIT is not a requisite for the program. Long Session 1: June 23 – July 12, 2019 $1,480, 2018 rate. This 3-week program will not include the Ellis and Associates Lifeguard Course. Long Session 2: July 14 August 9, 2019 $1,900, 2019 rate. This 4-week program will include the Ellis and Associates Lifeguard Course. In addition to camp counselor training programs, Tockwogh offers Leaders in Training.